An apple a day may keep your doctor away—but how about your pet’s veterinarian? One of the most popular fruits consumed (by humans) in America, apples can also be a healthy, low-calorie snack for our four-legged friends, too. Apples are chock full of vitamins, like A and C, as well as dietary fiber, calcium, phosphorus, and antioxidants. Not only can apples help satisfy your pet’s sweet tooth in a healthier (and non-toxic) way, but as an added bonus, munching away on apples can help keep your dog’s teeth clean—and even freshen up that stinky dog breath. Apples also help add omega-3 and omega-6 fatty acids to your pet’s diet, which can help keep your dog’s skin and coat healthy. Apples make an especially great treat for dogs who need to limit higher protein, meat-based treats for heath or dietary reasons, or that need to limit calories for weight control. Some veterinarians even believe that the vitamin C and antioxidants in apples can help improve certain degenerative conditions, such as diseases of the bones or joints like hip dysplasia, while the fiber in apples can support your dog’s gastrointestinal health. Just like in humans, the antioxidants in apples can also boost your pet’s overall health, and potentially provide an extra level of protection against diseases like cancer. Before you start slicing up apples for your pet, just be sure that the core, stem, and seeds are removed entirely. Apple seeds contain minute traces of amygdalin, a compound that contains cyanide, while the apple core poses a serious choking hazard. If Fido accidentally swallows a few apple seeds, it likely won’t hurt him, but regularly consuming apple seeds can build up cyanide in your dog’s system over time and lead to serious consequences because it prevents the blood from carrying oxygen throughout the body. Offering your dog small slices of apple will ensure that the sweet fruit is easy for him or her to eat—for safety reasons, never offer a whole apple to your dog, and you’ll also want to stay away from the harder-to-digest dehydrated apples. You’ll also want to be sure to monitor your pet for any individual reactions to fruits like apples, including diarrhea. Consuming too many apples can cause tummy troubles in both canines and humans. Also, keep in mind that apples do contain sugar, so if your dog has a condition like diabetes you’ll want to get your veterinarian’s okay before feeding them as a snack. 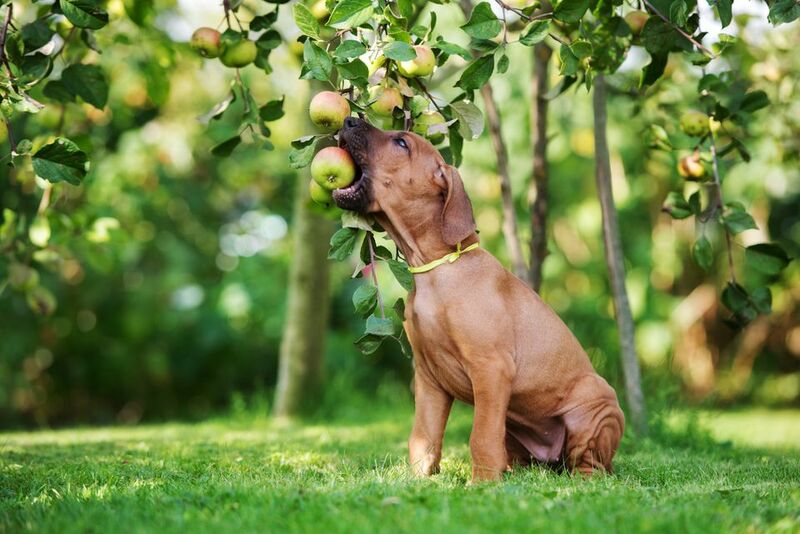 When choosing apples for your pet, most dogs love the sweet taste and crunchy bite of varieties like Honeycrisp, Fuji or Red Delicious apples, but you’ll want to try to choose organic apples whenever possible to avoid any harmful effects from pesticides. And it probably goes without saying, but you’ll also want to keep your dog away from apples that are candied or covered in unsafe sugary toppings like caramel or chocolate, as well as from other human desserts containing apples like pies or cakes. If your dog goes bananas for apples, there are lots of ways to incorporate this fiber-packed fruit into your pup’s diet (just be sure, as with all treats, to feed them in moderation and adjust their normal food intake accordingly). Many apple-loving dogs enjoy a little bit of homemade applesauce mixed in with their food. Serve up their apple slices with a drizzle of honey or peanut butter, or consider stuffing your dog’s beloved Kong toys with apple pieces. You can even make your own homemade dog treats using apples combined with other nutrient-packed, dog-friendly ingredients like pumpkin and peanut butter—just be sure to avoid certain spices, like nutmeg, as they can be toxic to dogs. In addition to being a healthy treat, apples can also boost your pet’s health in other ways; for example, a teaspoon of apple cider vinegar in your dog’s water or food bowl a few times a week may help alleviate certain chronic health conditions like arthritis, while also relieving gastrointestinal issues. Apple cider vinegar is also believed to be an effective flea-control product when mixed with water and sprayed on your pet's coat, and can even be effective at controlling odors on your dog’s fur and skin. Just be sure to check with your veterinarian before incorporating it into your dog's food.